At its mouth the Amazon River is a gargantuan, powerful river, sending a plume of fresh water up to 120 miles wide more than 250 miles into the Atlantic Ocean. Leave the mouth near Macapá, Brazil and head upriver nearly 3,000 miles to the confluence of the Marañon and Ucayali Rivers in Peru and the Amazon can still be more than a mile wide and 300 feet deep in some places. Continue upriver further to the Pachitea River and you may eventually find the boiling river if you have the right connections. When he was a child, Andrés Ruzo’s grandfather told him a story about a river that was boiling hot, where steam rose, food could be cooked, and a cup of tea steeped directly from the river. To fall into the river was to suffer immediate third degree burns and most likely death. The story included the legend of Paititi, a city of gold, and the conquistadors’ thirst for gold. An aunt suggests that Grandfather may have had too much to drink. Fast forward to 2011 and Ruzo is 24 years old and studying for a Ph.D. in geology at Southern Methodist University. He is back in Peru to map geothermal sites as part of his dissertation. Staying with his uncle Eo and aunt Guida, Andrés and his wife Sofía are preparing to leave for a few months of fieldwork when he mentions the story his grandfather had told him, suggesting that it was really not true. His aunt says, “Andrés, but there is a large thermal river in the jungle. I’ve been there. I’ve swum in it!” And his life changes in an instant. So begins a search for a river in a very remote region. The Amazon basin is a vast area that is roughly the size of 90% of the United States. It is more than 400 miles from the nearest confirmed geothermal site and has long been exploited for its timber and natural resources, especially oil. The Standard Oil Company and Rockefeller Foundation led the drive to find oil in the 1920s-30s. There was a rumor that a “Moran Report” existed and might include mention of the river since the presence of hot water is detrimental to oil exploration. The report might explain the origin of the hot water when there was no geothermal presence nearby. Or, it might reveal a previously unknown anomaly that would contribute to Ruzo’s research. Ruzo’s account is spell-binding. It illustrates in a clear and accessible way how he employed the scientific method to research a long-standing legend. It is a scientific expedition to find and explain the seemingly non-existent. Ruzo’s account also reveals a spiritual journey into a heart of enlightenment that resolves the gap between scientific exactitude and traditional, fast-disappearing values. Ultimately, Ruzo must balance his scientific curiosity with a moral obligation to protect a site sacred to the indigenous tribes who know the river as Shanay-timpishka. 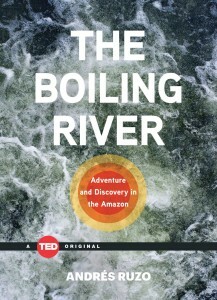 Watch Andres Ruzo’s TED talk about finding the boiling river.